I don’t know what it is about paintings of farmhouse animals that I love so much. I loved this cow’s slightly pink ears and nose. Pink tulips seemed like the perfect pairing to pick up that slight bit of pink. 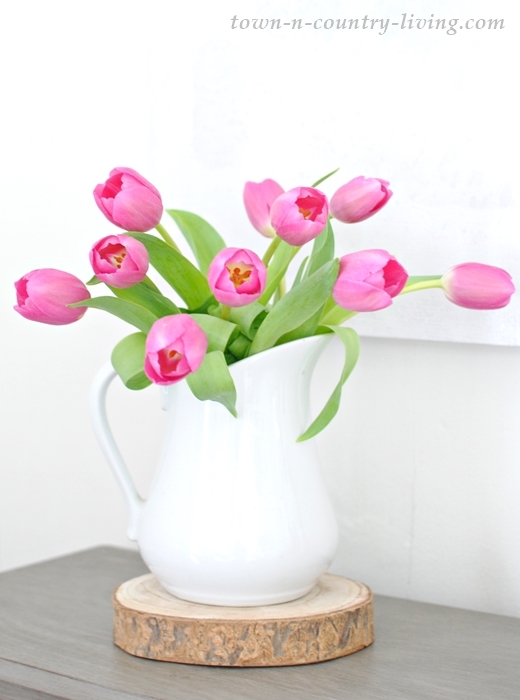 My sister came to visit me and brought these pretty pink tulips to cheer me up. She knows they’re one of my favorites. 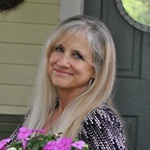 It was good to just sit and talk with her for a while. I hate that our lives get too busy to spend more time together. That’s something I intend to fix. To add a bit of earthiness to this corner with my farmhouse cow painting, I decided to display my brown bottle collection. 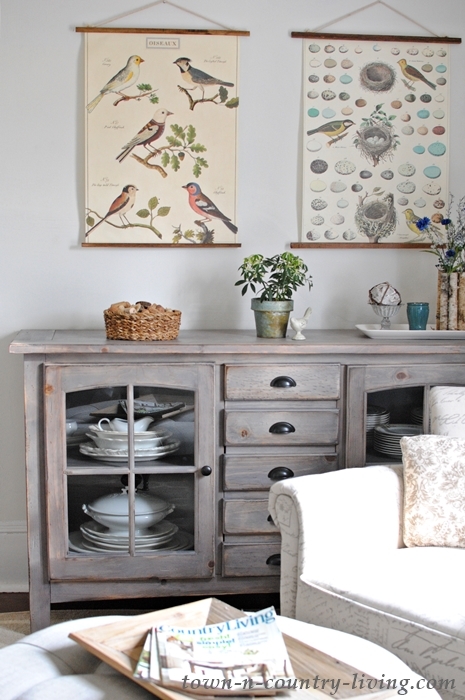 The little gray cabinet is new, too. I needed to find something small enough to fit on this wall. It couldn’t be too deep either. 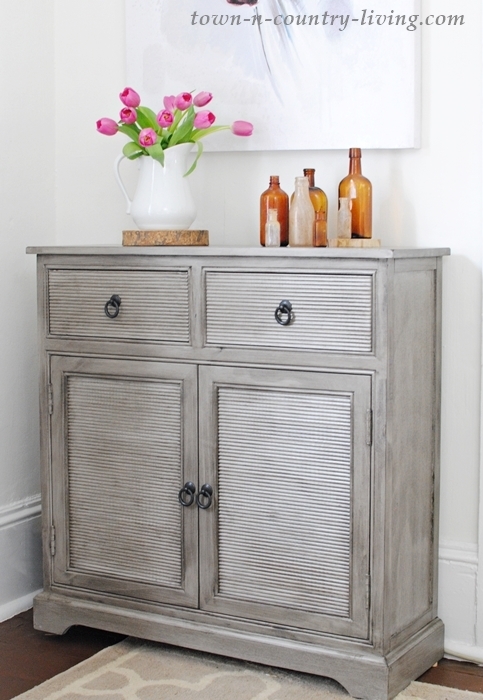 I found the perfect solution at Wayfair (this cabinet is currently out of stock but is expected back in early May). 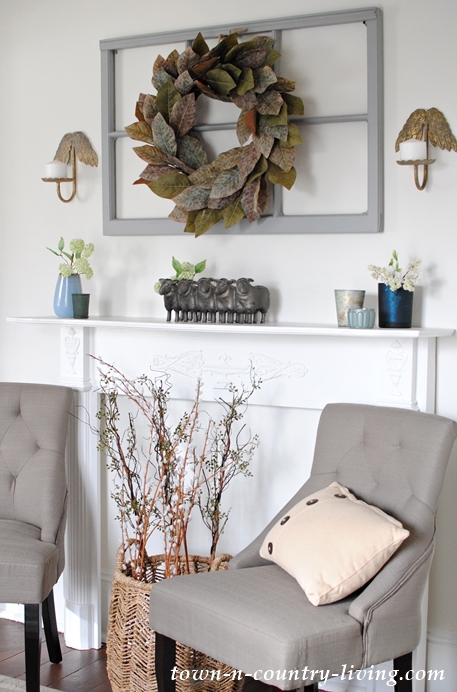 In case you missed my spring home tour last month, here are a couple more pictures of the rest of this sitting room. My new gray cabinet had to match the larger gray cabinet I found earlier at Home Goods. You can find the bird posters on Amazon and follow my hanging poster tutorial to create the hangers. I also moved the mantel in this space and gave it a fresh coat of white paint. 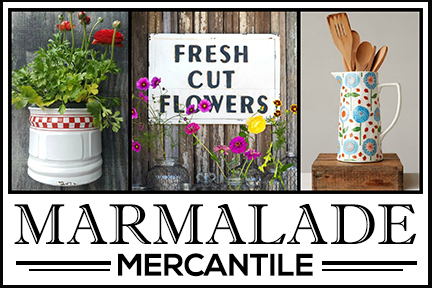 Note the little lamb planter which continues the farmhouse animal theme. 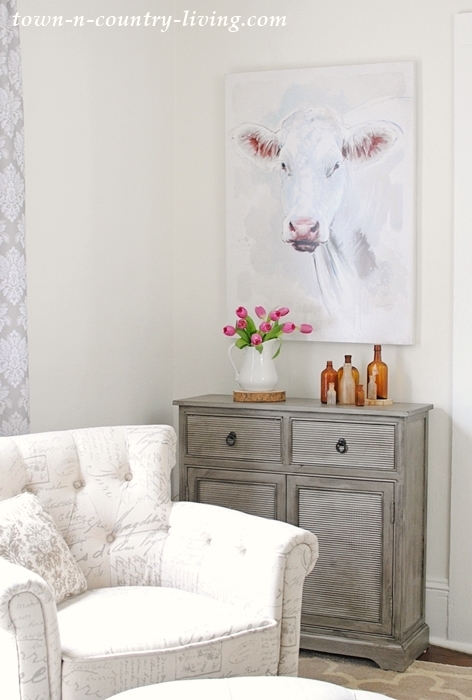 I’m pretty happy with my new farmhouse cow painting in the sitting room. I wanted something large and this one fit the space! I found it at Antique Farm House, which rotates their stock fairly frequently so it’s not currently available. I hope Bessie the Cow in my entryway isn’t jealous. 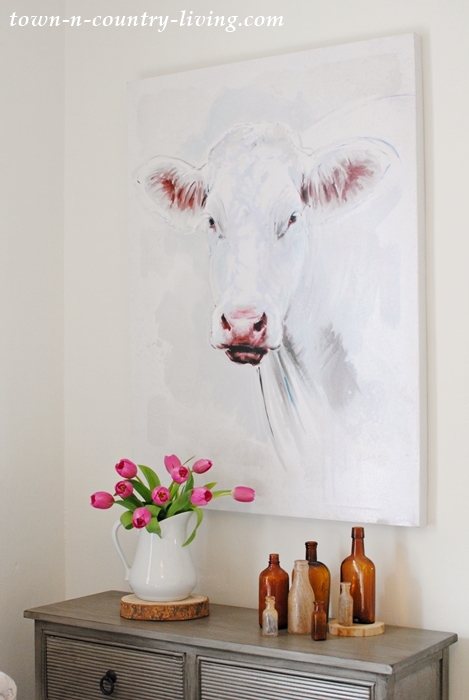 I suppose I’ll have to give my new farmhouse cow painting a name, too. Any suggestions? 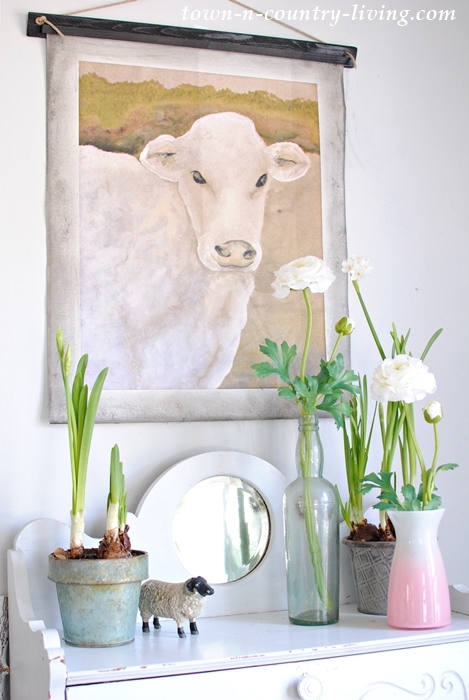 Love that new cow painting!….If a cow painting can look elegant, then this one is the one! Love the subtle colors and the beautiful shades of pink!…So glad you had a nice visit with your sister and the tulips look great with your pretty bottle collection. Happy Easter Jennifer!! I would call your new cow Pinkie – for obvious reasons. Love the nearly invisible colors of her body with the beautiful ears and nose carrying the painting itself. Great choice. 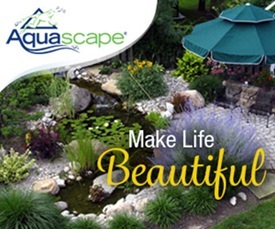 Your room looks so good – don’t you wish you’d done it a long time ago?? Whenever I make a change, and it looks good, I could kick myself for waiting so long to do something about it. Everything looks fantastic. I have no cow pics but you have made me feel that I need one. I do love me some cows and cow pics. How about Matilda, Madge, Pinky, Delilah, Betty Jo, or Berta? Have fun naming the new one. Love all the changes. Love your cow and your cozy corner. Cows make me smile, so great place to seat and look at Daisy and smile. How about Tulip for a name. 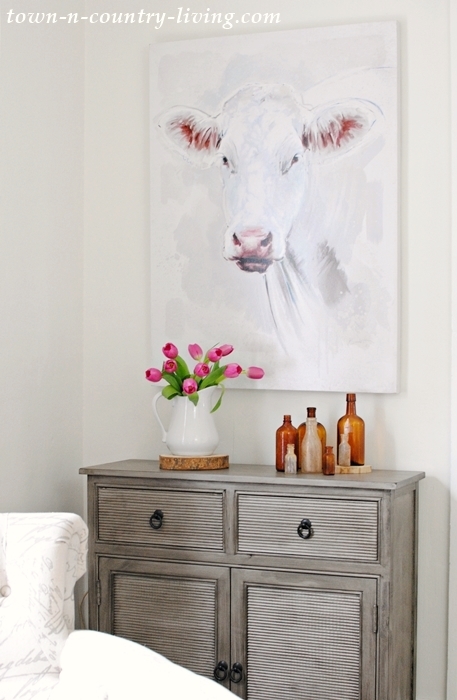 I saw a painting/photo similar to that cow in an issue of Country Living. I was thinking about ordering the paint by number kit they offered. 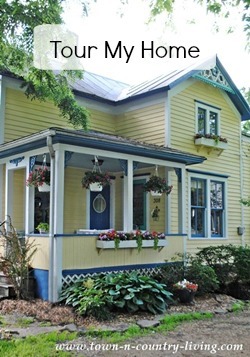 I love your sitting room. It is a charming space. 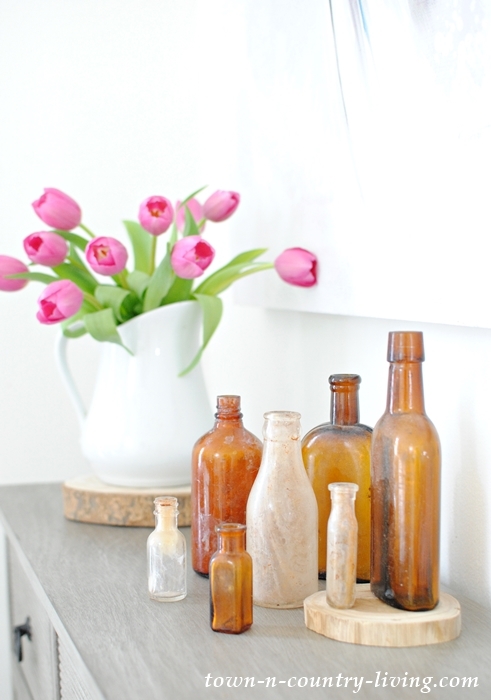 I like how you tied the picture in with the brown bottle collection and the pink tulips. I think Belle or Lizzie would be great names. I’m sure Bessie won’t mind a new gal with one of those gals.